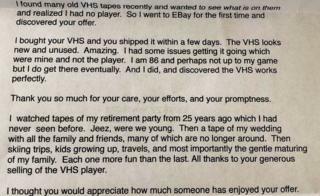 When a happy customer’s letter of appreciation to the seller of a VHS machine was shared on social media, it prompted a stream of stories about acts of kindness. Matt’s post was upvoted 160,000 times in just one day, with many people saying they were crying with emotion. The letter from an 86-year-old man from Phoenix, Arizona, described how he had been watching tapes from his wedding, attended by family and friends, many of whom he said were no longer around. He went on to say each of his tapes was more fun than the last and he liked watching the “gentle maturing” of his family. He also plans to frame the letter, which has since been shared on twitter, garnering more than 300,000 likes and 58,000 retweets in two days. Since then, people have been sharing their own tales of happiness and kindness. Kate Garnett bought her son a second-hand rucksack online when he was 16, ahead of a British expedition to Manu National Park in Peruvian Amazon. When she told the seller about her son’s plans and passion for plants, he said he would add a mosquito net, a bivvy bag (personal-sized waterproof shelter) and a torch free of charge, as his own expedition days were behind him. “He liked the fact it was going to a good home and more adventure,” Kate said. “It arrived with a letter saying where it had been: Europe, Asia, Australia and North America, but not South America,” she told the BBC. “Kindness costs nothing and the world needs it right now,” Kate said. Jim in Brooklyn described how it “melted his heart” when a woman tried to pay him after he explained how she could Skype her family in Japan. The two of them struck up a friendship whilst Jim was volunteering for a programme in New York , teaching older people computer basics, he told the BBC.